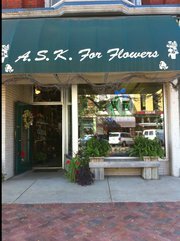 107 N. Michigan St. Plymouth, Indiana 46563 A family owned & operated full service professional florist established 1992, located in the historical downtown of Plymouth. 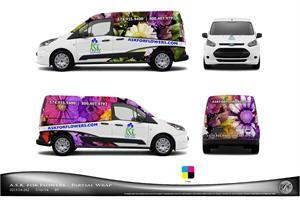 We will travel to your destination and provide you with a beautiful wedding and reception. Fun and bright with a mixture of flowers. Blue hydrangea with yellow flowers. Glass purple cube, with an assortment of flowers. A colorful display of tulips, colors and variety may vary. A Designer's choice of seasonal flowers. A designer's choice of seasonal flowers in a vase or basket. Our designers will create a beautiful arrangement in either a vase or basket of your choice, using beautiful fresh flowers. A designer's choice of seasonal flowers in either a vase or basket. 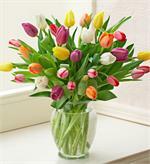 A mixture of colorful tulips in vase. Clear vase with roses, tulips, stock, heather, snapdragons, liatris and alstromeria. A mix of 18 roses in vase with a bow. Colors may vary. Call 574-935-9400 with additional instructions.